I'm thinking of building an ancient period army for wargaming use under the DBA rules in the future. Figs used will be 1/72s of course. 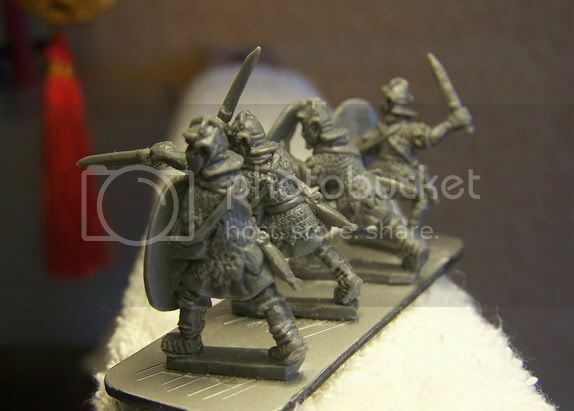 It seems to me that all DBA armies' basing sizes are "modulized" and say, the base for 4 blade men is 40mm x 15mm, and 40mm x 30mm for a 3-knights base, in 15mm scale. However, I've no idea what the standard sizes (if there is any) should be for gaming in 1/72. After having a look into the rules I got the impression that the width of bases counts in the game. So I think I'd better make this point clear before getting into the work. PS: since I'm totally new to wargaming, it'd be of great help if someone could put up their finished DBA armies here. This will surely provide me with lots of inspirations. Take the sizes for 25mm figures, they work really well. yes use the rules for 25mm..
the old british 25 mm is about the size of modern plastic 1/72..
i made a dba celtic army with plastic figs and based them for 25mm rules.. Thanks mates. I too think the sizes for 15mm might fit the 25mm figs. But units like camel riders (3 camels on a 40mm x 30mm base), or 40mm x 30mm bases for 7-8 hordes in 25mm seem a bit too crowded, no? chen wrote: Thanks mates. I too think the sizes for 15mm might fit the 25mm figs. But units like camel riders (3 camels on a 40mm x 30mm base), or 40mm x 30mm bases for 7-8 hordes in 25mm seem a bit too crowded, no? the purpose of basing in the dba rules is give a visual image of the density of the formation on the battlefield..
so more crowed are the figs more dense and disorderly is the fomation.. Thank you Luchs. Your Gaul army looks great. 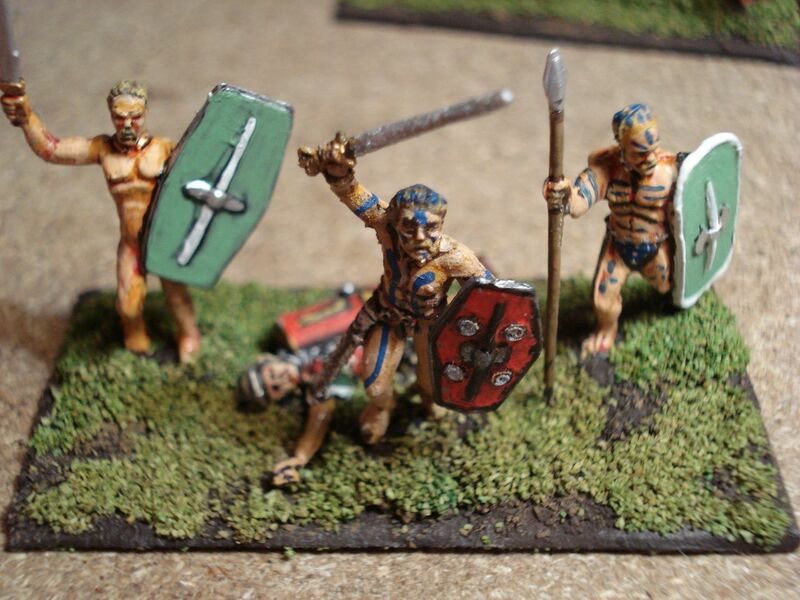 I like very much the dead Roman soldier on one of these bases. Hi Chen, all my ancient armies are based for DBA rules, so if you look at my posts (subjects until XVth C.) all of them are based following DBA base sizes for 25 mm. Here you have an example of Horde, 7 figures in a 40 x 30 mm base. 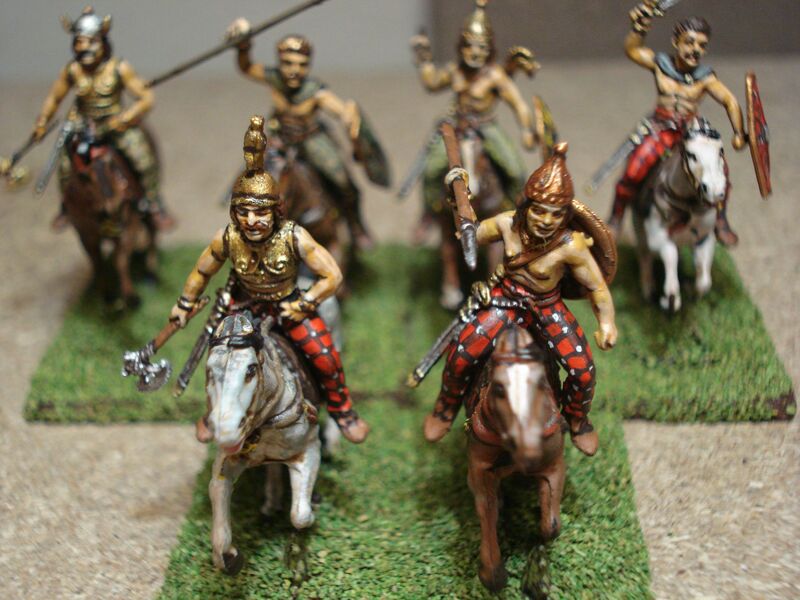 The 60mm wide bases for '25mm' figs are ideal for 1/72, though even then the 40mm depth for Cav can be a bit tight if hooves and manes are flying. I always use the 60mm width. Try putting 4 Zvezda spearmen or 3 Cv or 4Kn on a 40-wide! You are right, I made I mistake. All my bases are 60mm wide, not 40. Thank you gents! I'll go for the 60mm-wide bases, the armies shown in all of your pictures have just perfect feeling of formations. I've just definitely and irreversibly fallen into the blackhole of the ancient periods. Some of the figure numbers in DBA are given to suit players of DBM (DBA's bigger and older brother), so that they could use already held elements. All the double-based 8 figure elements are from DBM, DBA itself doesn't use double-basing. From what I can gather the 3/4 figure elements was to do with regular and irregular troops in DBM; something which doesn't come into it in DBA. The current DBA rules version is 2.2 and has ex DBM info in it. Apparently there is a V 3.0 on it's way which gets rid of the anomalous elements, e.g 4Kn. I use the 60mm frontage for my 1/72 armies but a dry run for fit is advisable if using Zvezda, 4Sp can be a tight squeeze. Thank you SV52, I've started basing my imperial Romans with 60mm frontage and I'm mostly following the advices in the official DBA rules as for the figure numbers (I don't know what version the one I have is). Your armies give me a perfect vision of what is to be expected. They look fantastic, and so are those in your blog! With the frontage problem set down, I'm now concerned with other questions. 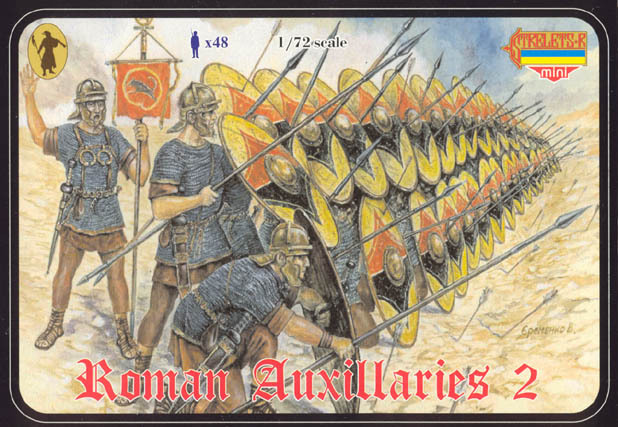 I can't see why the rule suggests that only 3 auxiliary infantries be mounted on one base, since they were in fact real normal infantries only with a non-Roman civil status. I'm also getting out of the rules a bit when deciding the base depths. I'm using 60mmX20mm bases for swordmen and 60mmX30mm bases for spearmen only for security consideration. I also got myself a StreletR set of auxiliaries in 2-rank formation poses. I find this formation shown on the box art really tempting and can't help thinking of making 7-figure bases (4 in the front and 3 in the back) to depict this ... Would all these cause problems in games?? 3 or 4 on a base is a DBM hangover, 3 figures represent 'irregular' troops and 4 figures represents 'regular' troops. In the case of Roman auxilia, I would say they were Regular as they were professional soldiers rather than warriors like say the Celts. Only my opinion of course. Yup depths do become a problem, figures holding spears vertically make life easier. The rules say that depth is less important than frontage, however if you use a non-standard depth, say 4Sp on 30mm, then you may need to identify the element as 4Sp to an opponent. If you don't intend to play in competitions or club games it doesn't matter, you suit yourself. If you used a 7 figure element, it only counts as 4Sp on a deeper base (no double-based elements in DBA despite listing them in the rules). Alternatively, you could identify it as 2x4Sp (two elements one behind the other giving rear support) this fits nicely on a 40mm deep base. In this case rather than one element it is a group for movement purposes, the disadvantage is that if the front element is destroyed so by necessity is the rear one - half way to a lost game. There's a short discussion on this very thing with Pk on Fanaticus forum at the moment. It's all great fun, after all that's why we do it. Thanks a lot, SV52! It's much clearer to me now. I've decided to give a go for the 7 fig base and I won't mind to consider it as 4sp. Because what we do so much here is to make the army and the battle look nicer, isn't it? BTW, I've also found the number problem for each pose in Zvezda's sets. In the auxiliary inf set, there are only 3 slingers, really an embarrassing situation. The point about using the DBM army lists is a valid one (I use them myself). What DBA doesn't tell you in its army lists is what troops are represented. 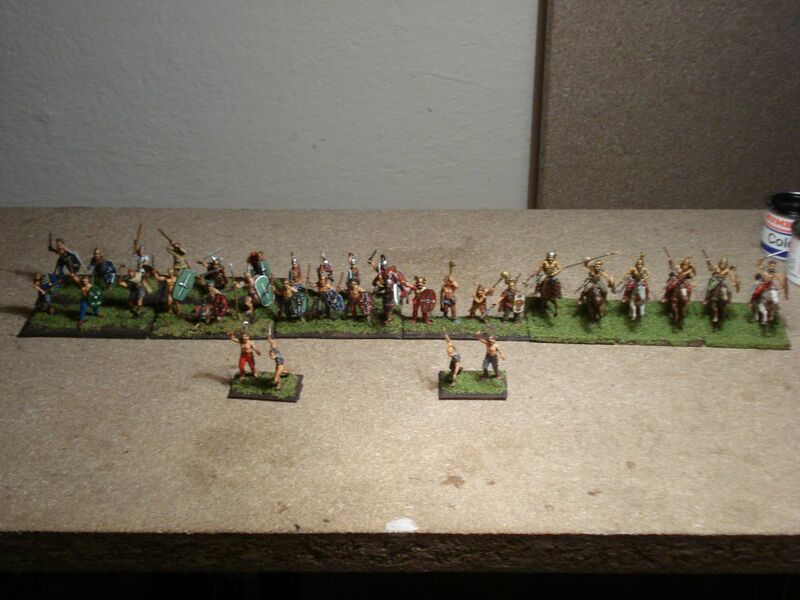 The armies I'm working on at the moment are DBA II/19a)b)c)d) for the Seleucid empire, the list covers 320BC to 83BC. Over this period of time the troops changed quit a bit, the details of which do not appear on the DBA list but do appear on the DBM lists. For example army d) has a 4Bd element, only by referring to the DBM list do you find out that they were 'fake Roman legionaries'. There are four DBM books of army lists, one for each of the same periods as the DBA sections. They can be quite expensive with the added complication that a new version called DBMM was released last year with updated army lists, mine are second edition DBM from 1998. If you aren't worried about having the latest and greatest and I think the differences are minimal anyway, then you should be able to get old versions at a reasonable cost on e-bay or generally on the 'net.